I sometimes think some politicians both locally and in Washington, D.C. no longer value the basics of civic engagement. The current normal in politics is polarization—them and us, liberal or conservative, progressive or old boy, environmentalist or developer, business owner or union member, poor or wealthy. Moreover, whichever end of the ideological spectrum you’re on, self-righteous talking past others and ad hominem arguing, especially on the various social media platforms now available, is expected. Over the last twenty-five years at least, many of our elected officials and their supporters have moved away from understandings developed over time—polite and respectful debate, the wisdom of incremental progress and the value of compromise. In the past, new legislators—at whatever level—would take some time to learn the legislative process, to work within the committee structure, and to conscientiously address district concerns. In other states and at the local county level here, term limits have increased impatience with the slow but purposely designed legislative process. Throughout our nation’s history, legislators of whatever party went to State Houses and Congress believing that the best way to serve their constituents, and their country, was to work honestly with their political opponents. Undoutbtedly, some ideas moved along at a snail’s pace. In truth, historic legislative has seldom passed without consensus-building, log-rolling and horse-trading. From Lyndon Johnson’s success with the Civil Rights laws to Franklin Delano Roosevelt’s New Deal reforms, and even Joe Farrington and Jack Burn’s work on Statehood for Alaska and Hawai‘i, bills became law through politicians who skillfully moved through the legislative process with members of both parties. Now a major bill like Obama Care (or the Affordable Care Act) passes only with Democratic votes in the U.S. House of Representatives. The great social upheavals from race and civil rights has narrowed the ideologies in the two major parties— it’s now rare to find the endangered Liberal Republican or the vanishing Conservative Democrat. Increasingly litmus tests are applied and a person is blithely labeled as a corporatist or a RINO (Republican In Name Only). Gilbert S.C. Keith-Agaran grew up in Pā‘ia and Kahului during the long end of the Plantation economy. He has represented Central Maui in the Hawai‘i State Senate since 2013. Previously, he served as the State Representative for Kahului from 2009–2012. 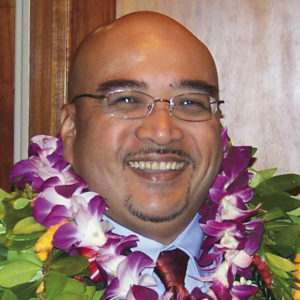 A Valley Isle native, he holds a Bachelor’s degree in American Intellectual History from Yale College and a Juris Doctorate from Boalt Hall School of Law, the University of California at Berkeley. He is a partner in the Wailuku law firm of Takitani Agaran Jorgensen & Wildman, LLLP. He worked in the Administration of Governor Ben Cayetano from 1995–2002. So the fact that eight of the newly elected Maui Councilmembers did a joint sign waving after the General Election was a good sign. Perhaps the nine-member County Council will bring more civility to local politics. I’m honored to represent Central Maui. I started as a “selected” Representative and Senator—appointed by Governors Lingle and Neil Abercrombie to my legislative offices—before I was “elected.” I’m very conscious that public service is a privilege. I also have a real job. Legislating is part-time and not my full-time job—I continue to practice law in Wailuku with my law partners Tony Takitani, Dave Jorgensen and Joe Wildman. Senator is just a title and not my primary role. I’m a husband, a son, an uncle and an active member of my church and our community. In the 29th Legislature of the State of Hawai‘i, which ran from 2017 to 2018, the Hawai‘i State Senate had no Republicans among the twenty-five members. For many of my ten years in the seventy-six member legislature, the GOP has never had more than seven members. Yet I did introduce a number of bills on behalf of Republican colleagues and as a committee chair heard and moved some of their proposals. Perhaps I’m out of touch. I still think that sometimes the other party may have a good idea, too. Not often, perhaps but sometimes.